Take advantage of SAFe 4.0. Find out how our software and services support the latest SAFe 4.0 guidance. 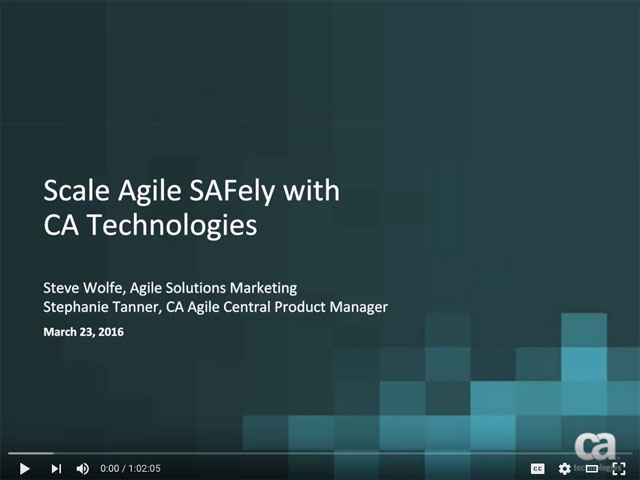 • See how the new capacity planning and release tracking tools in Agile Central help agile release trains deliver on-time and with maximum value. • Experience how Flowdock helps you better communicate and collaborate in real-time and across teams, trains and communities of practice. • Learn how you can launch an Agile Release Train in as little as three months and get to market 2X faster, using our Ready > Sync > Go approach. • Visualize the new SAFe concepts—like values streams, multi-level kanban and milestones—in our enterprise platform.